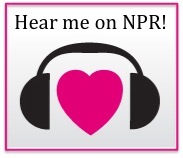 Last week, I was thrilled to be interviewed for a story about pregnancy recommendations on WHYY’s The Pulse, a weekly show about health and science. The segment, Navigating the do’s and don’ts of pregnancy by reporter Taunya English, included input from OBs, midwives, and moms. The interview got me thinking about how we make decisions for a healthy pregnancy. How do we sort through the huge amounts of advice – solicited and not – to make evidence-based choices? Who do we trust? I asked readers on my Facebook page to share their top picks for good pregnancy resources, and they had lots of good suggestions, which I’ve compiled in this post. Pregnancy can be incredibly overwhelming, especially the first time around. During my pregnancy with Cee, I was working as a postdoctoral researcher in a lab studying fetal physiology. In that environment, I had to be careful about exposure to some chemicals and infectious diseases that could affect my pregnancy, so I immediately started thinking about how we measure and respond to possible risks in pregnancy. That was on top of all of the usual pregnancy “rules,” which are overwhelming all on their own. There are things to avoid (alcohol, what feels like all your favorite foods, hot tubs, and caffeine is recommended only in moderation) and things to embrace (moderate exercise, healthy eating, adequate rest, the flu shot and Tdap vaccine). On top of these real concerns, there are all kinds of myths and inaccurate information floating around about pregnancy, raising still more questions. Pregnancy feels like one big exercise in risk assessment, and it doesn’t help that many of the sources of information are conflicting. (Of course, that problem remains after the baby is born!) I will happily do just about anything for the health of the pregnancy and baby, but I want to know that my choices are based on evidence, not myths or old wives’ tales. Woah, Mama! Hiking in the Sonoran Desert at 40 weeks pregnant with Cee in 2010. Yep, she was a big baby. I think one of our best sources of information should be our healthcare providers. It’s worth taking the time to find an OB or other provider who you trust and feel comfortable discussing your questions with. They’ve invested years of training in this field and guided many women through pregnancy and childbirth. Your provider should feel like an ally and a valuable resource. Unfortunately, not everyone has a lot of choice about healthcare providers. We also encounter questions on a daily basis that may not feel important enough to call our doctors, or we forget to bring them up in our all-too-quick appointments. Some of us prefer to learn through reading, and we like to consult multiple sources. For all of these reasons, I hope this list of resources is helpful. Inclusion on this list doesn’t mean that each resource is perfect, but I think each of these has something valuable to offer. I decided to divide the sources into two main categories. The first list gives information from medical organizations or similar sources. These sources are likely to be written or reviewed by doctors and represent the scientific and medical consensus on pregnancy questions. I like these as starting points for learning about any topic. I think it’s good to have a comprehensive print resource for pregnancy questions. You can find the same sort of information on the Internet, but every time you go online, you have to be on guard for inaccurate, contradictory, and anecdotal information. If you’re like me, sorting through all of that can have the undesirable effect of increasing anxiety and pushing your bedtime too late. The Mayo Clinic Guide to a Healthy Pregnancy (2011) – I received a copy of this book from our insurance company back in 2010 when I was pregnant with Cee, so I may be biased towards this one because of its familiarity, but other readers recommended it, too. I like that it is straightforward and well-organized, and I definitely grabbed for it in my second pregnancy as well. The Mommy Docs’ Ultimate Guide to Pregnancy and Birth by Yvonne Bohn, Allison Hill, Alane Park, and Melissa Jo Peltier (2011) – Three of four of these authors are OB/GYNs and mothers, and their stories make this book feel more personal. I haven’t used this book as much but have liked the sections that I have read. Your Pregnancy and Childbirth Month to Month from ACOG (new edition 2015) was recommended by a reader on my Facebook page, but I haven’t had a chance to check it out. Mayo Clinic’s Patient Care and Health Information page is a comprehensive online resource that offers reliable, quick answers to your questions. ACOG’s Patient Page – from The American Congress of Obstetricians and Gynecologists – includes short fact sheets about a range of topics, including many common pregnancy and childbirth questions. You won’t find citations here, but you’ll learn general recommendations from ACOG. To read about the scientific rationale behind many of these recommendations, you can read ACOG’s Committee Opinions, which are available to the public. MedlinePlus Pregnancy page from the U.S. National Library of Medicine compiles lots of resources from universities and governmental and medical organizations. NHS Choices Pregnancy and Baby – This site comes from the National Health Service in the U.K., so some advice may be different from what you’ll read in the U.S. One reader mentioned that she found their weekly emails useful. CDC Pregnancy page – Lots of general info on health in pregnancy, but especially useful for learning the latest on recommendations for vaccines in pregnancy, like the flu vaccine and Tdap shot, and for their information on the newborn vitamin K shot. Cochrane Reviews – The Cochrane Collaboration is an international organization that commissions experts to write systematic reviews on health topics, including many related to pregnancy and childbirth. Anyone can search their website for reviews and access abstracts. Unfortunately, full text of reviews is not open-access, but you may be able to access them through a local university library. MotherRisk – A website from The Hospital for Sick Children, University of Toronto. Provides comprehensive resources on drugs in pregnancy, substance use, conditions in pregnancy, infectious diseases, herbal products and nutrition, exercise, and occupational and environmental exposure. Also offers help by phone. LactMed – A database of information about drugs and other chemicals and breastfeeding. Not much pregnancy information here, but worth mentioning so that you have it handy after the baby arrives if you’re planning to breastfeed. They also have a wonderfully useful app. How is it that I don’t have more photos of my second pregnancy?! Here you have my bathroom mirror selfie at 26 weeks. The downside to the above sources is that most of them don’t break down the evidence behind recommendations, explain limitations of that evidence, or even provide citations to studies. I think many people are hungry for this kind of information. Science writers and others are filling that gap through books and blogs. These resources are written by people without formal medical training in pregnancy or obstetrics who have sorted through the research and presented their interpretation of it. This approach can have both advantages and disadvantages. We have to be cautious and cognizant that we may be relying on a single person’s interpretation of the evidence, and he or she may be missing a valuable perspective or be biased in their interpretation. (We all are, and I expect the same kind of caution when you’re reading my blog.) An advantage is that these authors may question assumptions overlooked by others, and they’ll explain the research and offer citations for those who want to dig deeper. Some of these may disagree with mainstream recommendations found in the list above. To me, that’s a flag that I want to read the sources myself or consult someone more knowledgeable so that I can understand the discrepancy and see if I agree. It’s always worth searching for your answer from several sources to gain a broad perspective. Expecting Better by Emily Oster (2013) – Oster is an economist who applied her risk/benefit analysis skills to pregnancy data. She walks you through the scientific evidence behind pregnancy recommendations, and as you read, you’ll also gain an understanding of how to evaluate studies. Oster’s advice about alcohol has been controversial, and I personally find that I am more conservative during pregnancy and tend to default to advice from medical professionals, but I still like the book a lot and found it to be a useful resource. Bumpology: The Myth-Busting Pregnancy Book for Curious Parents-to-Be by Linda Geddes (2014). I’ve only flipped through this one, but it looks promising. Geddes has also written many articles about pregnancy and science at New Scientist. The Informed Parent by Tara Haelle and Emily Willingham (2016) – This book doesn’t come out until next spring, but it will be a welcome addition to this list. I was lucky enough to read an advance copy. It includes lots of useful, evidence-based info about pregnancy and beyond from two of my favorite science journalists. Haelle wrote about her book in this article on Forbes (and also mentions mine). All Natural by Nathaniel Johnson (2013) – This isn’t a book about pregnancy, but it includes a chapter on childbirth. It’s also just a great introduction to applying skeptical thinking to many of the big topics of today, including nutrition, agriculture, vaccines, and medicine. Do Chocolate Lovers Have Sweeter Babies by Jena Pincott (2011) – I reviewed this book on my blog way back in 2012. This is not so much a practical guide but instead a fun and fascinating look at some of the quirkier questions you might have about pregnancy – or fun science you hadn’t even considered. 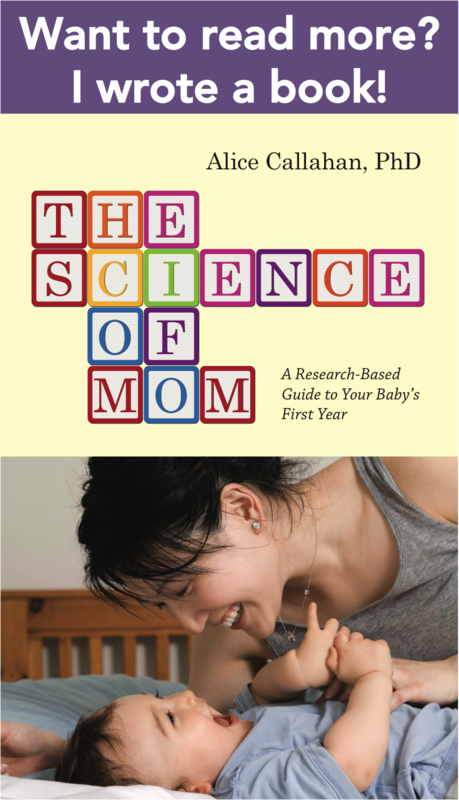 Several of the books included here, plus a few others, were also recommended and reviewed by science writer Maggie Koerth-Baker in this post at BoingBoing: Eight evidence-based pregnancy books for science-savvy ladies. I appreciate that she included books about history and anthropology in her list, because I think they add good perspective. Science-Based Medicine – A blog written by lots of smart people (most with medical training). It often covers issues of pregnancy, birth, and newborn medicine, and reading it is good training for skeptical thinking. Red Wine & Apple Sauce -A blog by science writer Tara Haelle (co-author of The Informed Parent). You can also follow her posts at Forbes and her Facebook and Twitter profiles. Expecting Science – A blog by PhD research scientist Amy Kiefer that covers fertility, pregnancy, and breastfeeding, with lots of citations! The Pregnant Scientist – A blog by a PhD physiologist. Not frequently updated (ahem, I don’t know any other blogs like that! ), but some good stuff in the archives. Science and Sensibility – A blog from Lamaze International with a focus on childbirth education. Evidence-Based Birth – A blog by Rebecca Decker, PhD covering pregnancy and childbirth questions. What resources did you use for information during pregnancy? Are there any that you would add to this list? What a fantastic compilation of resources! Finding the best places for information can be so challenging. This will definitely remove some of the angst. I think the “Evidence-based birth” one might warrant a little skepticism…For instance, you had an article about how silly it was to try and compare skin to skin with taking the baby away for hours, but those are exactly the studies that the author is using to show that skin to skin is so superior. And the author has hidden her page on home birth, but it’s not hard to find with google, and it says NOTHING about the relative safety (or lack thereof) in home births. And “Science and Sensibility” has one about turning a breech baby by burning Chinese herbs near your feet. Thank you for highlighting these problems. I wasn’t aware of these particular examples but worried a bit about bias from both of these sites when I listed them. I thought they might appeal to readers more inclined to the natural childbirth sites, but either way, I don’t want to send people to sites that aren’t accurate. I’ll look more closely. Thank you! Thanks for commenting and referencing Science & Sensibility’s post on moxibustion for turning breech babies. The research referenced in that post was published peer review research. When research is solid, it is important not to cherry pick the research to support only the beliefs that one holds. As the community manager and writer for Science & Sensibility, I pride myself on the fact that we publish information that is substantiated by research published accepted journals. With the exceptionally high maternal and neonatal mortality and morbidity rates in this country, and one in three women giving birth by cesarean, turning a breech baby and avoiding major surgery can help improve birth outcomes. Thanks for your comment, Sharon. I think there is valuable information at Science and Sensibility, and sometimes it’s good to get different perspectives. Skepticism is always good:) I’m skeptical about the claim that Chinese herbs could turn a baby as well, and if I wanted to know more about that, I would definitely do some more digging. I trust my readers would do the same. I agree with your comment and that is why a reader can always find the references and citations to do their own research as well, as any smart consumer would do. Thank you for providing us we another great source of information for families to make informed decisions. So much amazing info! I don’t think I tapped into nearly enough in my pregnancy will definitely be doing more research for the next!